Austrian architects Winkler + Ruck Architekten and Ferdinand Certov have been selected to create a "floating" roof extension for Vienna's Wien Museum. 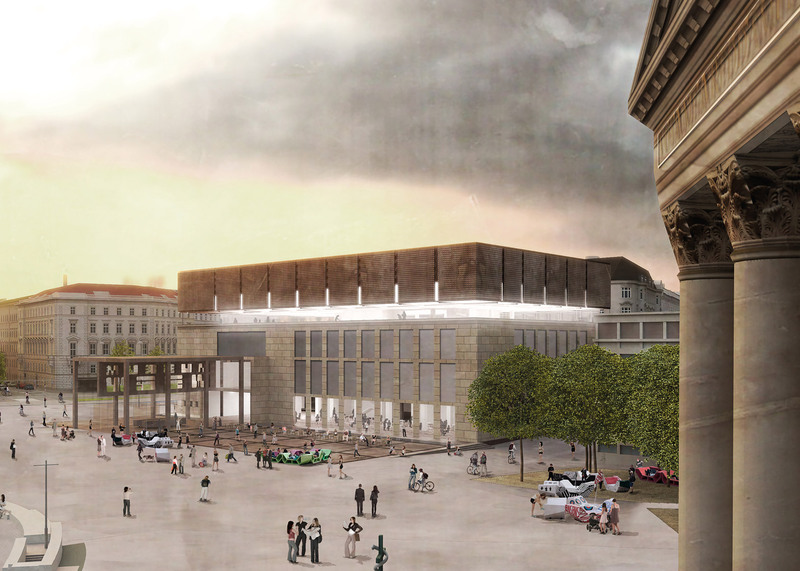 The Klagenfurt- and Graz-based architects were selected from almost 300 entrants in the design competition, which called for proposals to overhaul the museum located on the city's Karlsplatz. The extension will be separated from the roof of the museum's listed Haerdtl Building – designed by Oswald Haerdtl in the 1950s – and will almost double its gallery space to 12,000 square metres. "The idea is as simple as it is brilliant: the extension will sprout from the roof of the museum," said a statement from the jury, which included museum director Matti Bunzl, and Austrian architects Bernardo Bader and Emanuel Christ. "A classic modern pavilion with closed facade will be set on top of the Haerdtl Building, which represents classic Modernism in a different sense," it added. The existing first and second floors of the building will house the museum's permanent exhibitions. These include Viennese history displays ranging from the Neolithic Age to the mid-20th century, and a collections of paintings by artists Gustav Klimt and Egon Schiele. The new raised top floor will host special exhibitions, while a gap between the old and new parts of the building will provide a viewing platform over the plaza – which is also home to the Baroque Karlskirche church. "Maybe our key to success in this incredibly sensitive task was our view of architecture as background art, a quality that forms the foundations of a city’s experiences, maybe in a more reserved but precise and stringent way," said a statement from both Winkler + Ruck and Certov. A new glazed entrance and cafe will protrude from the front of the existing building to provide access to the plaza. "With this floating pavilion, the ground-floor cafe and the new entrance cube, the museum opens itself out to Karlsplatz as a 21st-century plaza," said the jury. "The idea is simple and memorable – and convincingly executed," it added. "The listed Haerdtl Building will be complemented by a light crown, forming a kind of chronological stack." Across the nearby Stadtpark, Austrian architect Wolfgang Tschapeller is working on plans to overhaul the University of Applied Arts Vienna, with proposals that include facade-climbing staircases and giant balloons.